There are so many teaching strategies out there. Fortunately, as a homeschooling parent, you have the freedom to choose a teaching method that works best for you and your family. One method that might be on your radar is Montessori. 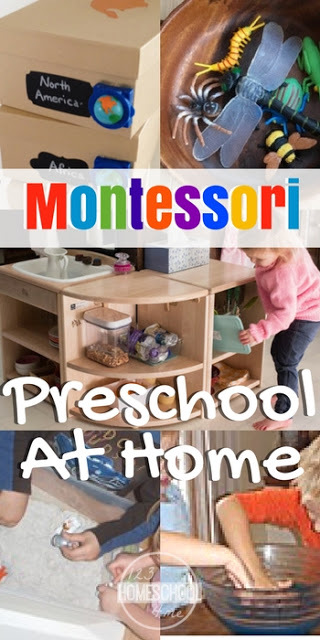 Using Montessori preschool at home is a great way to foster a love of learning in your children. Before teaching Montessori preschool at home, it’s important that you know what Montessori actually is. You’ll want to understand how Montessori works, the philosophy behind it, as well as how to implement it in your home. The Montessori Method was created by Dr. Maria Montessori. She designed this philosophy based on the fact that children are naturally curious and eager to learn. Here are the key elements of Montessori you’ll need to know if you want to teach Montessori preschool at home. Child-Centered – The main focus of Montessori is that it is child-centered. The student leads his own learning as he develops a passion for knowledge. Supportive Environment – The environment in a Montessori space is designed to support the child’s learning. Space is thoughtfully prepared so that children can either spread out with an activity or move to a quiet space for alone time. 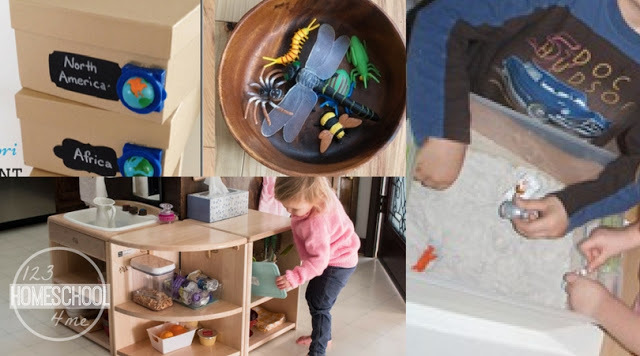 Activities, materials, and utensils are all located within reach and in designated space so the child knows how to find it. Hands On – The Montessori Method uses hands-on activities to help kids learn. Children should engage in sensory-motor activities that engage all 5 senses. This helps the child develop a true understanding and a love of learning. Peer Learning – Montessori classrooms use peer learning to help children grow. Multi-age groups are used so that the older children can help teach and guide the younger children. Fosters Development – Because Montessori focuses on more than rote learning, it fosters a child’s social and emotional development in addition to cognitive development. This creates a healthy child both emotionally and physically. If you’re looking for a hands-on, engaging method to use at home, the Montessori Method is for you. This method is intuitive for kids, making it easy to use with your children. One of the most important things you can do to use Montessori preschool at home is to create the right environment. Tables & Floor Mats – Montessori is different from traditional classrooms in many ways, but a key difference is the workspace. Traditional classrooms use desks whereas Montessori spaces use tables or mats and cushions on the floor. With the Montessori method, kids can get comfortable while they work and learn. Open & Spacious – Your Montessori space needs to be open and spacious so that your preschooler can spread out with activities and puzzles. Displays Student Work – Children should be proud of their accomplishments. Your Montessori space at home should display your preschooler’s work, helping them understand that their work is valuable. Encourages Free Choice – The space needs to encourage free choice. Since your preschooler will help lead his learning, make sure you have bins and crates filled with activities and materials that your preschooler can use. In addition to creating an environment conducive to learning, it’s important to have the right materials available for your preschooler. These materials will help guide your child on their path to learning. Sensory Bins – Sensory bins are great for a Montessori preschool at home since it encourages children to use their 5 senses. You can create different types of sensory bins, picking themes that go along with the season or with your child’s interests. Continent Boxes – Montessori encourages kids to learn about different cultures. You can help your child learn about this by creating continent boxes that include activities and items from cultures around the world. Montessori Kitchen – Create a kitchen space for your preschooler to learn and have fun. This helps your child learn important life skills through free play. Discovery Baskets – You can help guide your child’s learning by putting together different discovery baskets. These baskets should include different materials that will help your child learn about a specific topic, letter, or theme. 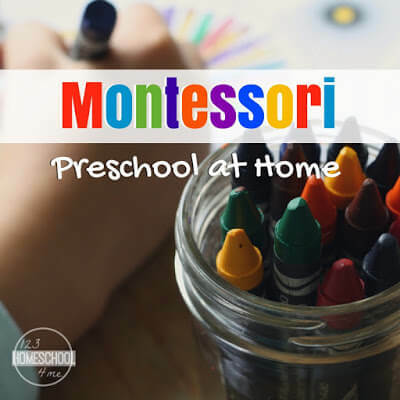 To teach Montessori preschool at home, simply create an environment that invites your child to learn and have materials and activities available for your preschooler to play with. You’ll love watching your child develop a love of learning as they have fun with this hands-on teaching method.